As DLC tied to my favourite character of Final Fantasy XV and two satisfying previous DLC episodes, I had high expectations for Episode Ignis’ story. As expected based on the last two Episodes, Episode Ignis gives unique fighting mechanics to Ignis to suit his fighting style and reveals what happened in a part of the game he was absent. 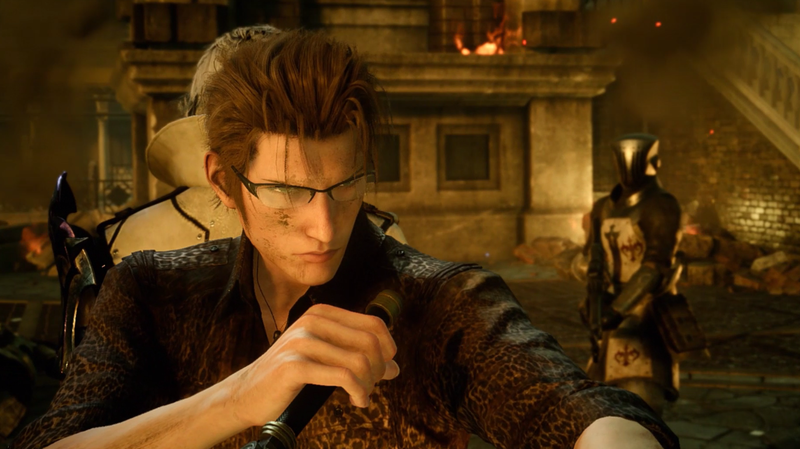 Unique to Episode Ignis however is a special Extra Verse portion that puts a new twist on big moments of Ignis’s story that had a fan of Ignis and XV’s core story like myself captivated in all the right ways. Delivering the kind of quality expected from the last few DLC chapters coming to XV, Episode Ignis mostly delivers and is a story chapter that fans of Ignis and Final Fantasy XV won’t want to miss. Spoiler note: Due to the nature of when Episode Ignis is set in Final Fantasy XV's story, mild spoilers may follow. Episode Ignis starts off strong in the epic Leviathan portion of Final Fantasy XV’s story and details what happened before Noctis wakes up, focusing mostly on Ignis as promised. Ignis finds himself separated for the group on his way to help Noct and it becomes his mission to make his way through the fallen debris and fire in Atlissa without help from his teammates. Despite the dire situation, Ignis is the best person for this kind of job as the Crownsguard’s resident tactician and as many crossroads present themselves, Ignis’ dedication to Noctis is shown as he pushes forward relentlessly. A lot of my favourite things about Ignis were the more humourous side of him with his recipes and wit in Final Fantasy XV, but Episode Ignis zeroes in on showing how far Ignis will go to protect Noctis and made me further appreciate the deeper side of his character. Even though Ignis as a character had fairly good development between the core XV game and the Brotherhood anime, Episode Ignis acts as a great climax to his journey and while only a couple of hours long, it features some key moments that helped me better appreciate his story that stands well enough on its own. Episode Ignis has more than one story to tell in more ways than one. Co-star Ravus’s part in Ignis’ story shows another side of him and their brief time together gives background and a softer side into someone that often acts as an antagonist in different parts of XV. Episode Ignis also features a part called Extra Verse that offers an alternative story branch that challenges final events in Episode Ignis’s arc and in the core story with a different possibility that fans of Final Fantasy XV’s story won’t want to miss. I don’t want to spoil what these events are at all, but the possibility shown was a highlight of the Episode and was the kind of special ‘wow factor’ that I was hoping for in this Episode’s story that impacted not just Ignis’ story, but parts of XV’s core story as well. 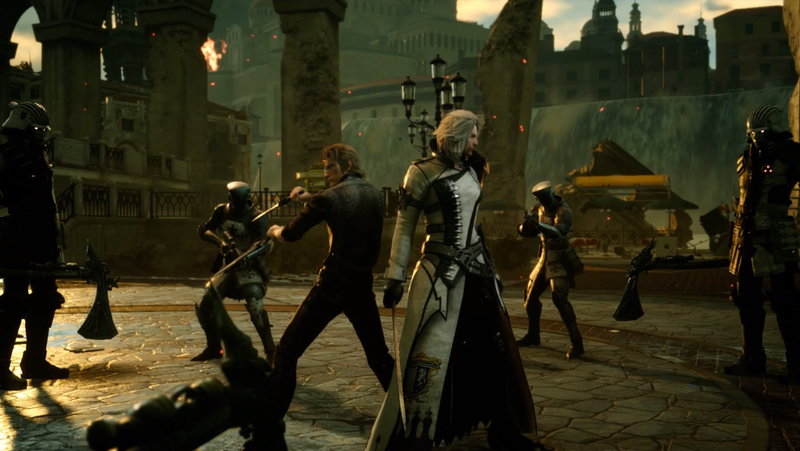 Between story moments, combat in Episode Ignis suits his role of tactician well, with balancing elements, attack range, timing and special attacks all making their way into Ignis’ combat style. Fighting with his spelldaggers, Ignis constantly has an element attached to his weapon, serving the function of showing how Ignis will attack rather than just what element his attacks will give, with fire meaning he’ll attack one enemy, ice attacking enemies within range and lightning darting him around the field in a new take on elementals that made me consider the placements of enemies more. 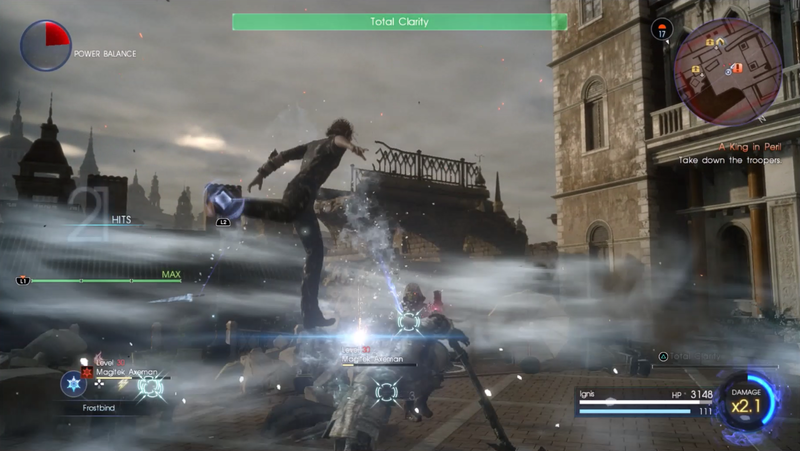 On top of this, blocking helps to heal Ignis and boost his Total Clarity ability gauge that does a stronger version of his attacks and special attacks like Overclock and the familiar High Jump can give an edge in battle. All of this tied in with a damage multiplier that raises as you attack continuously makes for an active battle system that is engaging and requires thought to master. During the main portion of Episode Ignis, I found this system a little tough with so much to balance between blocking and using Total Clarity in battles with a lot of enemies, but during the fun extra battle with Noctis, I began to appreciate this new twist on XV’s mechanics. Ignis can dart around the field like Noctis, but his attacks consider the battlefield in a new way fitting to battling with more thought. This and its truly active nature makes it probably the most fun I’ve had using the combat with the other characters in Final Fantasy XV so far. The extra fight with Noctis is a fun bit of replayability for those who want more than just story from Episode Ignis, along with the area of Atlissia as a whole. While there aren’t any side quests like there were in Episode Prompto, there are well-hidden documents scattered through Altissia for those interested in lore and a recipe-filled skill to be unlocked for those with patience. Exploring the city above ground and through water was an enjoyable way to explore the big area and I’m glad at least a few things were put in to allow for more exploration outside the main story. In spite of these extra things to do in the main part of Episode Ignis, the most enjoyable time I had post-story was with the extra fight with Noctis, with Noct’s many weapons and skills making him a formidable foe and the battle full of one-liners was my favourite of the extra battles in all three of the current DLC Episodes. As the finale of the DLC Episodes for the main party of Final Fantasy XV, Episode Ignis finishes on a high note. Its extra story moments gave something new to the story of a character I already liked, along with a new combat style that was fun to master when given some time outside the main story. Its story manages to fill in a few gaps of XV's story, with a few surprises of its own in its touching Extra Verse and the option of continuing to play with a few things to find that make the experience mostly a recipe for success. Episode Ignis’ story may have only been a couple of hours long, but this impactful extra slice of story does the best job at adding new meaning to moments in Final Fantasy XV’s core story, and the main Episode and its Extra Verse are probably something fans of XV will be quite interested to see. A well-oiled recipe for more story and tactical combat fun. You can pick up Final Fantasy XV on Amazon* and Episode Ignis on PSN and the Microsoft store! Did you play Episode Ignis? If you have, what did you think of it?